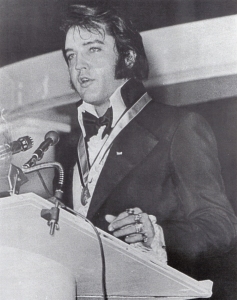 Elvis Jaycee Award – Over the years, honorees have included John F Kennedy, Robert Kennedy, Orson Wells, Howard Hughes and Henry Kissinger. 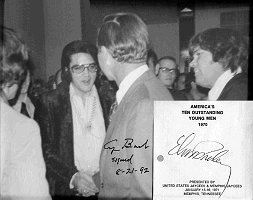 January 15, 1971, Elvis was selected as one of the Ten Outstanding Young Men of America by the national United States Junior Chamber of Commerce: better known as the Jaycees. At the luncheon Elvis accepted the honor, at a banquet held at the Memphis Municipal Auditorium, he was reflective, misty-eyed and clearly humbled to be in the company of the nine others, who included Thomas Atkins (Boston’s first black councilman) bio physicist, Dr. Mario Capecchi and cancer researcher Dr. George Todaro. Elvis had once again invited the Memphis Mafia gang and his young wife of only 2 years to join in the celebrations. The Jaycee Award was one of the few trophies that Elvis received during his lifetime that held a special place. It represented Elvis initiation into the mainstream, acceptance by his peers for his contributions as a humanitarian and entertainer. The only award the Elvis attended in his lifetime. 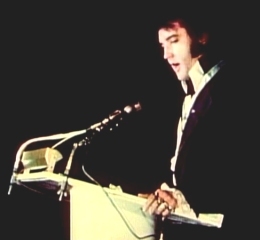 When I was a child, ladies and gentlemen,” said Elvis to a crowd of two thousand. I’d like to say that I learned very early in life that without a song the day would never end. Without a song a man ain’t got a friend. Without a song the road would never bend.